Gallery Shows Index.Outsider art quilts, paintings, drawings, mixed media art. Turtle Moon Studios. Susan Shie and James Acord. 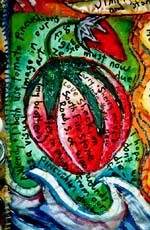 Above right: Detail of "Love Shack" ©1997 Shie and Acord. Susan Shie's store at Fine Art America. Prints, cards, mugs, phone cases, etc, etc, prointed on demand. Large Quilts Gallery. 2his goes from 1988 to 2004. Unfortunately, it has a lot of gaps and the images are small, so I hope to upgrade it eventually. It's where you'll see the major pieces from throughout my earlier career. Kind of a retrospective view of the most important works from those years. 2004 Aries, Taurus, and Pisces Paintings Gallery. 2003 Paintings Gallery. My Blossom Suite painting series. All sold or donated to art auctions. 2003 Quilts Gallery. Some small to medium sized painted and hand sewn art quilts for sale. Healing Quilts Gallery. Begun in August, 2005, looking back over our career thus far, starting with "Tattle Tails" from 1993 for now. Will add more later! Peace Buddha Girls Gallery. Made as paintings in late February, 2003. All sold now, except one piece which I quilted. Zodiac Paintings Gallery. Paintings on canvas made by me, Lucky, about my mother, St Q, and the signs of the zodiac. All in a private collection, but Amber Lotus made a 2005 calendar of them, and sells greeting cards of them, which make wonderful birthday cards. The Dishtowel Quilt Project. This is an online gallery show of 29 quilts, made by 30 artists. Each quilt has the same dishtowel calendar as its basis. The show was presented at The Mansfield Art Center in June and July, 1999. Hope you like it. Watch a video of Susan Shie giving a gallery talk at a solo show of her work in 2010. Video made by Andrew Galli. Web site design © Susan Shie and Jan Cabral 1997. All subsequent web site work, ©Susan Shie 1997-20187. This page updated by Susan Shie, February 17, 2018. Web site hosting by Key to the Web, Ltd. ©2018.